Dr. Shah graduated from the University Tech De Santiago (UTESA), Santo Domingo in 1990. He completed residency in Internal Medicine at the Bronx-Lebanon Hospital, New York, in 1995. For the next seven years, he worked at the Bronx-Lebanon Hospital as chief resident, attending physician and a medical director. 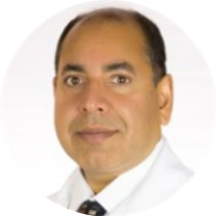 Dr. Shah had excellent bedside manner, an in depth knowledge of medicine and a mind set to learning and teaching medicine. He taught medical students and residents and held the assignment of Assistance Professor of Medicine from Albert Einstein College of Medicine. He moved to Colorado in February 2012. He sees patient in his office and admits and manages sick patients at the Aurora hospital. He loves gardening. He is an expert in growing fruit trees and grape vines. He loves to travel, and plays table tennis. Dr. Shah was very informative and explained things very clearly. He was polite and professional. The receptionist and assistant were also very courteous. I would highly recommend Premier Family Medical! I am calling my insurance separately to complain that is now poor my experience was here. Nice people, uninformed professionals. I left mostly confused and pretty annoyed. Very professional! I appreciate that he listens and took the time to answer the questions I had. He went over everything I needed. The point of my visit was to establish care. Everyone in the office was very friendly. I willrecommend him to my family and friends who are also new to Colorado. The office was nice/well-kept and the office staff was very helpful. I didn't have to wait long to see the Dr. Shah, who was able to help with what I needed. He was very caring qnd spent a good amount of time with me and made sure all my questions were answered! Nice office, lovely and helpful staff who were very welcoming I went in with two problems, Dr. Shah only focused on one then asked me to meet him out front. He never showed his face again. His staff helped me findreferrals for my issues. He just wanted me out the door.